Kitchen renovations can be monumentally stressful and time-consuming. The payoff is well worth it but the process to get to your dream kitchen is often less than desirable. To help you along this process, we have arranged a list of our favorite tips on how to survive your kitchen remodel. Are you designing a new kitchen or planning a kitchen remodel project? Do not forget about what goes underfoot! There are so many kitchen flooring options on the market. Here is some information about the 10 most popular choices to help you make an informed decision. More and more we are incorporating technology in the home. This internet of things includes everything from the ability to control your thermostat to turning off lights or activating security systems. These smart devices for your kitchen are fun and convenient. Never burn dinner again! 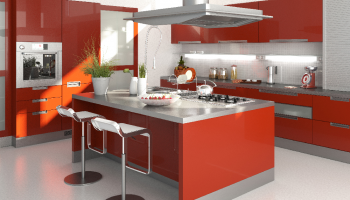 Add a splash of inspiration to your kitchen with these brilliant kitchen cabinet colors ideas. Bring in a little cheer, tranquility, and joy to everyone’s favorite room in the house! Designers are showcasing many trends for the coming year. Contact the Friel Kitchen and Bath Design Center for a consultation. Our designers will work with you to formulate the best plan to incorporate upgrades, no matter your budget. Together let’s make a creative change! The kitchen often becomes the centerpiece of your home. There is no right or wrong way to decorate in here. Here are 9 kitchen color schemes for inspiration.The best approach is to consider your kitchen to be the perfect expression of you or as an ultimate representation of your or your family’s personality. When discussing bathroom basics, there are essentially three elements that are fundamental: the toilet, the shower or tub, and the sink. Choosing the best bathroom sink for your needs involves a bit more than simply finding one that looks good. Here are a few things for consideration when making your decision. These kitchen island design tips offer some great ways to maximize this creative workspace. Visit the Friel Lumber Kitchen and Bath Design Center. Our team can show you all the creative ways you can make the best use of this centerpiece. Allow us to help you make the most of your investment!